The rumble of radial engines from two of the rarest World War II bombers, the B-29 Superfortress FIFI and B-24 Liberator Diamond Lil, will be heard over the skies of Chattanooga in May when they visit Lovell Field Airport as part of the AirPower History Tour of the Commemorative Air Force. The two bombers are to be accompanied by the P-51 Mustang "Gunfighter", the C-45 Expeditor "Bucket of Bolts", T-6 Texan and T-34 Mentor trainers and a PT-13 Stearman. The air show will be open to the public from 9:00 a.m. until 5:00 p.m. Wednesday through Sunday, May 22-26. Access to the ramp where the warbirds are parked is $15 for adults, $8 for children ages 10-17 and free for children nine and under. Supporting aircraft will be offering rides all five days. 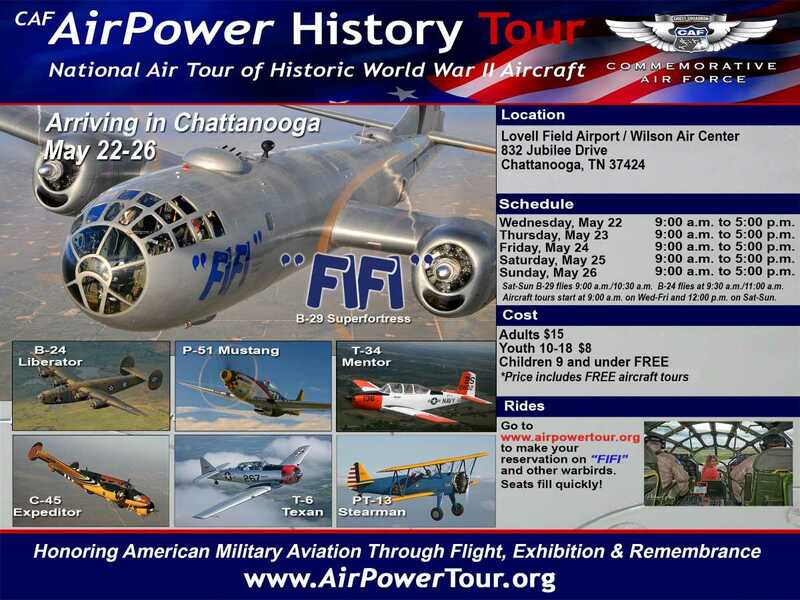 The B-29 flies on Saturday and Sunday at 9:00 a.m. and 10:30 a.m. The B-24 flies on Saturday and Sunday at 9:30 a.m. and 11:00 a.m. Cockpit tours of the B-24 and B-29 will be available beginning at 9:00 a.m., except on Saturday and Sunday when they will begin at noon. To book a ride on any of the CAF aircraft, go to www.airpowertour.org.